Carolina had it all against Gonzaga; hope none of it was fool’s gold. Roy Williams called it the best atmosphere for a non-conference game he has seen in the Smith Center. The first true sell-out of the season had a capacity crowd roaring with every 3-pointer the Tar Heels made and every offensive rebound that resulted in 27 points compared to zero second-chance points by a Zags team playing without two regulars. 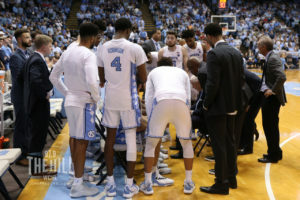 After a sensational first half, perhaps Carolina’s best of the season, Mack Brown provided his own theatrics when he walked onto the court with his new coaching staff and said he and Sally were “happy to be home.” It is indeed great to have Mack back, but his situation is not unlike the basketball team’s performance. Brown has created a splash, for sure, following two seasons of 5-18 football, but will he win enough to bring the fans back to Kenan Stadium to watch annual bowl teams? The Hoop Heels missed their first five 3-point attempts against Gonzaga and then made 13 of their final 20 treys, including 6 of 8 from leading scorer Cameron Johnson. The offense and offensive rebounding preserved a double-digit lead over the Zags, who got 29 points on Carolina’s uncharacteristic 23 turnovers, some of which were truly troubling against a well-prepared opponent. Gonzaga coach Mark Few knows the Tar Heels well and his team picked off some lazy passes from the high post to the wing, a few looking almost like a robotic practice drill. Those produced easy run-out scores for the Zags, who also had their share of open drives down the lane after Carolina had over-extended its defense to cover 3-point attempts. The Bulldogs hung around by shooting 56 percent in the second half when Luke Maye’s 12 points and 9 boards helped hold off the fourth-ranked visitors. Ol’ Roy likes to say things look better when the ball goes in, but that won’t always be the case, especially for the longer 3’s. The Heels hit some other tough shots they made look easy. In short, to beat Kentucky this Saturday and compete for first place in the ACC, Carolina will have to play far more fundamental basketball on both ends of the floor that will require more smarts and dirty work when the shots aren’t falling so plentifully. Clearly, Carolina won’t outscore everyone.